.... well for me anyhow! I had to work today and working as a collector is not the best thing on a Saturday, for some reason people just don't want to talk to you about how much money they owe! Mark and me are going to the cinema tonight to watch Slum Dog Millionaire. It's got a good write up so I'm quite excited. Two days off now so hopefully some more jewellery making! I have a couple of projects to finish so I'll be getting on with them. Here is my Ice Queen bracelet, just about to be listed on Etsy now. 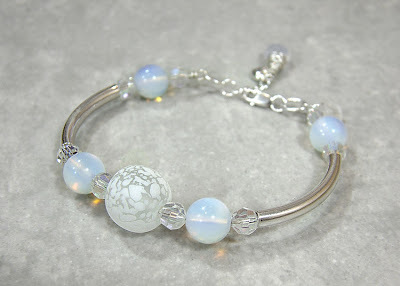 It features a beautiful lamp work bead by Jan Jennings, sterling silver, crystals and Opalite! Thanks for visiting my blog. Gorgeous colours in this bracelet and great name!